Okay. Grab a pencil, paper and ruler. Make 4 random dots (or ask someone else to make them for you). Join up the dots to make a quadrilateral. 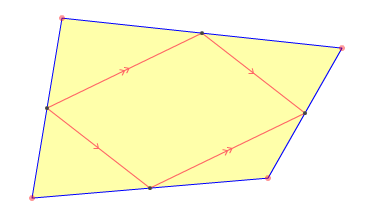 Put a mark at the midpoint of each line in this first quadrilateral. Join up the four new points to make a second quadrilateral. The reason for the pretty mathematical image above is that I wanted to create a buffer between the question and the answer... which I am now about to tell you. If you followed the instructions above, you should have ended up with a parallelogram. I find it shocking that you can start with four random dots and then end up with a perfect parallelogram, as shown here. You can test this by playing around with the interactive graphic on this page on the Math Open Reference website. You can drag the four orange dots wherever you want, and it automatically generates the first quadrilateral, the midpoints and the second internal quadrilateral, which is always a parallelogram. I spotted this on a NASA website called Astronomy Picture of the Day, even though it is a video, not a picture. It shows the Sun as it was observed in Sweden in 2017. There is a different Astronomy Picture of the Day each day, so visit regularly if you are interested in the universe.